Throughout he is in union with beast, thee two bloods flow parallel lives through the terrible beauty. A sixteen year old John Grady horse-breaker, heartbreaker, and seeker of ones worth. He is on a journey comparable to a kind of archaic odyssey. Nations before him fell and lost their right of land, he felt in his grandfathers death that an end of line would occur with the ways of the cowboy in that it would be diluted like that of nations gone. Land sold out lost to new technology and oil invading a Cowboy way of life passed down. A literal journey like grapes of wrath and blood Meriden. Linear storytelling and one of his more approachable works. A journey of inner and outer in battle, in his rejection he seeks out beauty and paradise after wondering through wasteland, there are tests some Hellish and then redemptive with absolution and ultimately seeking all the pretty horses in possession. In the final stage of this tale the narrative tells that there is a finding to the truths of life through experiencing the wilderness, the love and pain of it. What he traversed had him come near to that coming of age, of heart, a great learning through the falls and that terrible beauty within it. 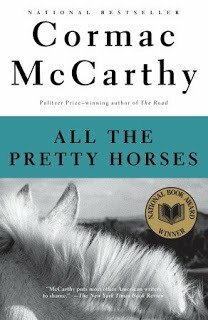 McCarthy has you again in his vice and his words surround you with a majesty and greatness, his sentences have you ponder over and immersed in the thick of some workings of this great place called earth. “We weep over the might have been, but there is no might have been. There never was. It is supposed to be true that those who do not know history are condemned to repeat it. I don’t believe knowing can save us. What is constant in history is greed and foolishness and a love of blood and this is a thing that even God—who knows all that can be known—seems powerless to change. “The candle-flame and the image of the candle-flame caught in the pier-glass twisted and righted when he entered the hall and again when he shut the door. He took off his hat and came slowly forward. The floorboards creaked under his boots. In his black suit he stood in the dark glass where the lilies leaned so palely from their waisted cut-glass vase. Along the cold hallway behind him hung the portraits of forebears only dimly known to him all framed in glass and dimly lit above the narrow wainscotting. He looked down at the guttered candle-stub. He pressed his thumbprint in the warm wax pooled on the oak veneer. Lastly he looked at the face so caved and drawn among the folds of funeral cloth, the yellowed moustache, the eyelids paper thin. That was not sleeping. That was not sleeping. “What he loved in horses was what he loved in men, the blood and the heat of the blood that ran them. All his reverence and all his fondness and all the leanings of his life were for the ardent hearted and they would always be so and never be otherwise.